Medicare patients that are newly diagnosed with diabetes will often be overwhelmed by many concerns. Not least among them is the concern about whether Medicare will cover diabetic testing supplies. Rest assured, Medicare does help pay for glucometers and diabetic testing strips, albeit with limitations. There will be differences in coverage, however, based on whether or not the patient is strictly a Medicare Part B patient or has a Medicare Advantage or Medicare supplement plan. Why should a diabetic spend so much money on these expensive diabetic testing supplies in the first place? Most seniors who become diagnosed with diabetes will have the type of diabetes in which making lifestyle changes will dramatically impact their prognosis. One of the most integral factors for a diabetic is understanding how important it is to test the glucose levels in their blood often. Many studies show that the more often a patient tests their sugar, the healthier those patients stay. 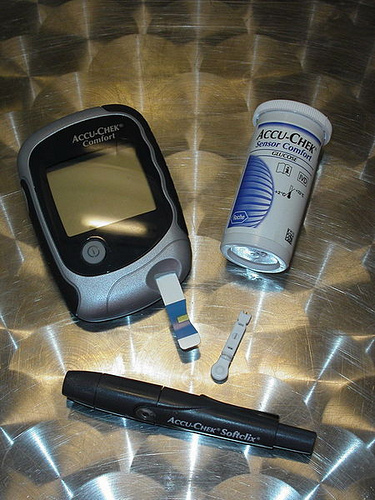 All Medicare patients that have diabetes will find Medicare pays for a glucometer to use testing strips, a lancing device, glucose control solution (in order to check the glucometer to ensure the machine is working correctly). The amount of supplies that Medicare will pay for depend on the overall therapy for the patient. Patients that are on insulin are able to receive more blood glucose testing strips per month than are patients that take only oral medication to treat their diabetes. For patients that require insulin, Medicare will cover up to 100 testing strips per month. They will also cover up to 100 lancets – which are the tiny needles used to poke a small hole to collect a drop of blood. The lancing device that holds the lancets may be replaced every 6 months. Note: Many newly diagnosed diabetic patients will feel queasy about discussing the need to test their blood sugar. The idea of having to stick one’s finger (or in some cases forearm) can be quite upsetting to people that are not used to doing it. Many people have a general fear of needles. What is important to know is that the gauge of needle used in lancing devices has gotten thinner and thinner over the past few years. This is partly due to better technology — the quality of needle at the microscopic level has gotten better, the needles have become smoother, the material strength more consistent. There are also coatings on the metal which makes them much more “slick” so that they hurt less upon use. All of these factors mean that the use of diabetic testing supplies is less uncomfortable than ever for Medicare patients. What is the most convenient way to get my blood glucose strips and other diabetic testing supplies? Medicare patients will find many options for getting their testing supplies. Again, much will depend on the patient’s Medicare coverage. However, local pharmacies are often very happy to help patients process the paperwork to cover diabetic supplies and submit them on behalf of the patient to Medicare (this is actually STILL done via paper!). Patient’s whose Medicare D coverage allows their supplies to be covered may also find their local pharmacy able to accept that payment. It is very important to make certain that the company that provides the Medicare patient diabetic supplies is enrolled with Medicare as an authorized supplier! Diabetics that received supplies from non-authorized suppiers will find themselves responsible for 100% of the cost of the supplies! There are many services such as Liberty Medical that operate convenient delivery services for diabetes testing where patients may get their blood glucose testing strips delivered. These are basically mail order services that will send the supplies through the mail. Finally, many patients may have mail order pharmacy coverage wrapped into their Medicare Advantage coverage. In this case, patients will have the option to receive their supplies through their insurer directly. What are the different manufacturers and models of diabetic monitors that I can choose from? Ok, now that I have my supplies, can someone please show me how to use a diabetes testing monitor?